Hello all! Some of you may have wondered where I’ve been for the last couple of weeks though I assume you might have guessed that I’ve just had other things occupying my time. And that’s pretty much what it boils down to. I got caught up in a whirlwind of real life commitments and decided to let myself off the hook as far as blogging was concerned for a little while. However, this review of Daredevil #25 provides the perfect reason to get back into the swing of things again. There’s also plenty of Daredevil news to report that’s not specifically tied to this review, but I’ll return to those items the very end of this post! First of all, let’s take a moment to appreciate the fact that this is issue #25 of Mark Waid’s run on Daredevil. 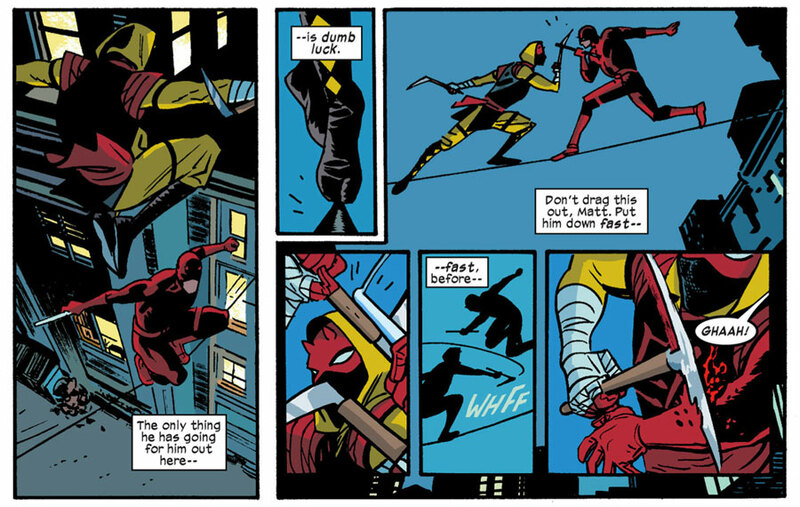 Even artist Chris Samnee, who came onboard later, now has twelve issues of Daredevil to his credit. Javíer Rodriguez, meanwhile, has been around since the very start, coloring almost every single issue of volume 3 thus far. Still, even twenty-five issues in (and that’s not counting a “point one” issue and a couple of cross-overs) it’s been less than two years since Daredevil #1 came out in July of 2011. We Daredevil fans have been spoiled with more than one issue per month, on average, and a creative team who is still going strong. In fact, it seems like they’re just getting warmed up. Having said that, I didn’t expect to appreciate Daredevil #25 as much as I did. Both the preview(s) and a recent interview with Mark Waid suggested an action-heavy issue. While action scenes are obviously central to the superhero genre, I will readily admit that I’ve always been partial to what happens in between the action scenes. I see them more as a means to an end, I suppose. Still, I know many Daredevil fans would get a big kick out of seeing Matt really battling it out and was more than willing to save much of my enthusiasm for next issue. I knew I’d enjoy Daredevil #25, but wasn’t sure I’d be the target demographic for this particular chapter of the ongoing story. I was wrong. Not only is the central fight scene amazingly well choreographed (careful readers will note that Chris Samnee is credited as “storyteller,” along with Mark Waid due to the Marvel method approach used in the writing of the issue), but there are enough layers to it to satisfy a wide range of tastes. As has been the case with most issues of this run, no opportunity is wasted to teach the reader more than he or she already knew about who Matt Murdock is and how he approaches everything he does. A new villain – sporting a really cool-looking costume – is introduced that challenges Daredevil in new ways. Throughout the issue, we learn things we didn’t already know about the kinds of environments Daredevil prefers, why he detests others and how he views his own strengths and weaknesses. We are even treated to a flashback scene featuring Matt’s old mentor Stick (who really should have been reported to child protective services…) and get brief glimpses of Matt’s memories of his father and are reminded of why he is still such a major influence in Matt’s life. Needless to say, the issue looks absolutely amazing throughout. 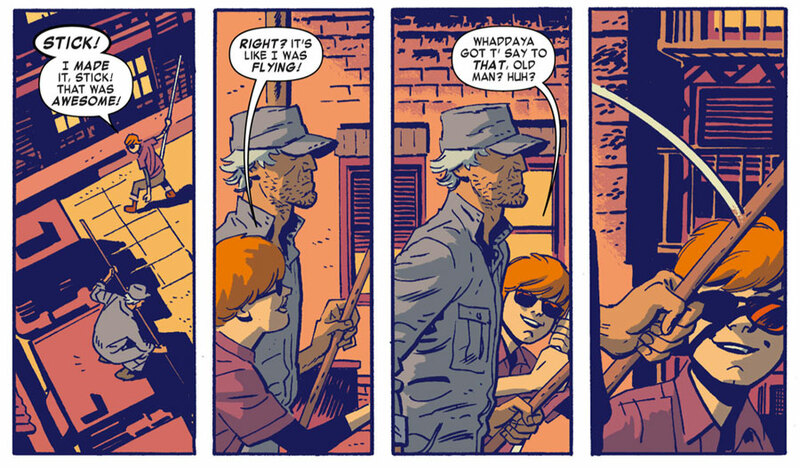 Chris Samnee takes the relatively freer reins handed to him and goes wild in the best way possible, and Javier Rodríguez’s colors somehow look even better than usual. Despite a wide variety of settings and poses, the art is as easy to follow as it is easy on the eyes. Daredevil #25 is also an unusually brutal and violent read, and the people who are still getting a Silver Age vibe from Daredevil these days (don’t ask me why) are bound to feel a little shocked by the end of the issue. I continue to be astounded by the variety of scenes and storytelling techniques these guys are giving us every single month, where the one constant seems to be the entertainment value and the consistently high level of quality. Keep it coming, and you’ll keep me interested for years. 2) Chris Samnee has been nominated for an Eisner Award! How great is that? Congratulations, Chris! We’ll be rooting for you! 3) There have also been a couple of interviews with Mark Waid. Here’s a longer one with IGN and a brief one with Comic Book Therapy. But can’t you fool Matt’s “lie detector” with a pacemaker? Holy crap, he’s GOT a pacemaker! Called it! “I don’t scare.” Love it. Perfect. Oooh, a big empty warehouse. Acrobatic fight? I am enjoying a fight scene. I CARE about a fight scene. How did this happen? Uh, that’s not running, that’s more like hobbling … this is BAD. Hobble, Matt, hobble! WHO IS THIS BAD GUY? When a book gets so good, the days until the next one comes out seem to take forever. It definitely feels like that now. I’m very curious if Javier is going to colour his own pencils. Might sound like a dumb question, I don’t know. The name ist not spelled “Javíer Rodriguez” but “Javier Rodríguez”. Is it written like that on the book? Funny. @Isaac: Nope, that’s my typo (and I corrected it now).I went back to check and at least I’ve written it the right way everywhere else! Thanks. Best Daredevil fight in years! Question: The character on Ikari’s chest looks like a D, but is actually the Japanese character for “Moon” not “Fury,” does this mean anything? I JUST found this site! Great. Waid is doing such a great job on this book. He’s amazing. I can’t wait for when he teams Daredevil and the Hulk (love what he’s doing on that book as well) down the line; I look forward to how he has those two interact. Someone mentioned in a previous post that they think the master villain is Deathstalker. That’s how I found this site; Googling Daredevil/Deathstalker/Waid because I think so as well. I loved DS back in the day and it would be cool if it’s him. It would be even cooler if he could climb out of that crazy coffin (hard to do with only half a body, I know) and take on DD again. Love the site and I am now a permanent follower. Plus I get to see old Gene Colan DD art as well? Double Word Score! @Kgreen: Glad to have you onboard! Tell your friends and so on. 😉 Yeah, I’m also over the moon about the current quality of this title. I will stick with this character through thick and thin, but it’s much easier when it’s this good. Well, the wait between issues isn’t easy, but you know what I mean. Another beautiful issue. Did anyone else catch the possbile allusion to Mr Fear at the end? The part where Ikari tells Matt that only his master alone knows how to FRIGHTEN him… But I think that might just possibly be a little bit of mis-direction on Waid’s part, and I’m still sticking with Death-Stalker! I’m disappointed that the book wasn’t nominated for more Eisner awards this year. But i’ll be keeping my fingers crossed for Chris all the way until July 19th. A terrific issue, terrific fight scenes and I can appreciate Waid’s new take on breaking down Matt. But now this mastermind seems to gone a step further and somehow ‘perfected’ it by leaving Ikari’s sight intact. Unless there is some form of symbolism at work here (‘I can do everything you can do Mister Murdock but I can SEE as well’) isn’t that a bit redundant? If a person has their normal sight, would that person find a radar sense useful? I may need to read over the DD radar section here to see if this particular instance is covered but I’d still be interested to read your thoughts Christine on how a sighted person could best use a radar sense. I’m also interested to learn Ikari’s real identity. He seems to consider himself a warrior on par with DD so does he have some past connection to Matt? I also thought it was interesting that he used dual Japanese blades ala Elektra and her sais. Deliberate perhaps? Despite my misgivings, I think Ikari is a wonderful new addition to DD’s rogues gallery. Well done Waid and Crew.